The Only ManyChat Course You Need For Digital Marketing! ManyChat has widely become one of the most used tools in digital marketing. With this course I not only break to the mold of ManyChat to the fullest, I teach how to have a ManyChat agency with zero dollars, how to mix Facebook Messenger in with your marketing and how to have a well-rounded system for everyone to grow from no matter if you just start or you have been in the game for years and need an edge over the competition. We all know that chatbots are the way of the future however they are the way of now, so many of the top digital marketers are getting rich by keeping their customers happy with messenger through offers, helpful hints, or just a quick reminder. You can get a small section of the massive course right now, our mini-course is just the first three chapters so get it while the offer lasts. You landed here because you have an interest in making money with Many Chat or Facebook messenger which could be for one or two different reasons. Either you are starting from scratch or you are already in digital marketing and looking for more tools or an easier way to save money. Let me ease your mind and set your thoughts to rest, you are in the right place. From working 60 hours a week as an engineer to taking online course after online course for digital marketing and Facebook ads, I know how frustrating it can be trying to find a better way. Because I am absolutely tired of people talking a big game then not producing so this is where I enter to provide a simple but effective way to teach everything you need to know for Facebook messenger using ManyChat for digital marketing. This ManyChat course is currently in the beta testing phase to make sure that everything is 100% clear and user-friendly so everyone can be more focussed on success rather than course structure or issues. The course is only open to those that qualify, meaning application only. There are perks to being a beta tester and they are well worth it. The cost of entry to the course in beta testing phase is reduced by 50% for a show of support for those willing to be in the beta test, those people will become the first people to show success because there is no question of if…..more like when. I already have successful members in the course so now it is entry by request only until launch, however then the price goes to normal and the extras are reduced….no worries, the course still gives so much that you would be shocked to see what is inside. Smart Bot Marketing Master Course is the course name and seems like a long drawn out name so let me explain further. This ManyChat course will provide the ability for someone with no experience take this course then learn ManyChat, Facebook Pages, Facebook Advertising, Clickfunnels, and SEO therefore giving a deep understanding of being a real marketer so that when you decide to have a ManyChat agency or Social Media Marketing Agency then you will have everything you need to become successful. After all, the more tools that you have in your toolbox then the easier it is to get clients because you have multiple offers as a foot in the door, often a free start so you do not have to invest in your business other than the course price and maybe an LLC or a DBA to make sure your business is 100% legal. Why would I talk about an LLC or DBA? Because you will need this to protect yourself after you start making money with your successful marketing business which I am sure you will as long as you put forth the effort. What Is In This ManyChat Course? Who Is The Messenger Course For? How Do I Know If This Course Is Right For My Situation? Just a few items to think about but are not limited to. Does This Messenger Marketing Course Have Support? We have a private Facebook group. Yes, we have a private Facebook group for member only to help each other as they grow and also offers bonuses to those most active members to help with assistance. What Makes This Course Standout? 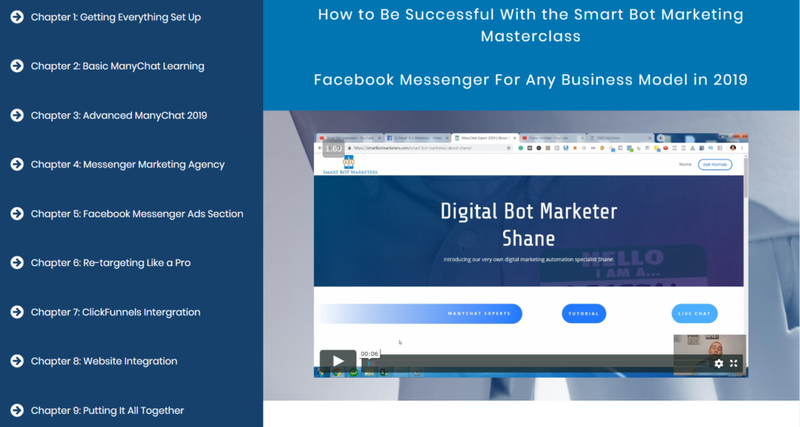 This course is designed to fit Chatbots in with all of your other marketing that you have such as Facebook ads, Websites, Clickfunnels, and more along with teaching each of these for those who do not know yet to have a well-rounded circle of marketing for any business.